Home » News archive » VREID: Relea…s." VREID: Release Lyric Video for "One Hundred Years." Watch the video below at the official Season of Mist Youtube channel. VREID songwriter/ bass guiratist Jarle Hváll Kvåle states: "To me, 'One Hundred Years' is the strongest song in our band's history. It’s a song that captures the essence and multitude of Vreid. It's a song that we will guaranteed play in all our concerts. 'One Hundred Years' was inspired by a poem by the great Norwegian author Knut Hamsun. This lit a torch that resulted in this song about the everlasting duality of nature and human nature. The video is done by Håvard Nesbø, with spectacular filming of the dramatic and inspiring scenery and history of my beloved Vestlandet (western Norway). An eternal source to inspiration. He visualized the song beyond what I could have imagined." VREID were formed in 2004. The Norwegian metal brigade rose from the ashes of WINDIR after the tragic perishing of the "Sognametal" legends with the declared mission of exploring new musical paths. The Norsemen proved true to their words and have so far delivered 7 albums and one DVD, which each received high praise from critics and fans alike. VREID chose a course of constant evolution that is marked by thematically denoted phases regarding their often historically inspired lyrics. This became particularly clear with albums 'I Krig' (2007) and 'Milorg' (2009), which both revolved around concepts dealing with resistance and liberation of Norway during World War II. 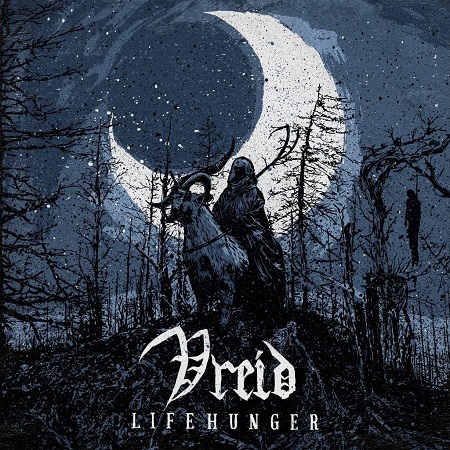 With their following three records, VREID returned to their Norse roots, especially on latest full-length, 'Sólverv' which received high critical acclaim in 2015. VREID's style is often referred to as black 'n roll and Metal Hammer UK described their music as "a unique time travel in metal" as elements of 70's rock, 80's classic metal, and Norwegian black metal are all clearly audible. Now with eighth album 'Lifehunger', black 'n roll is back! With eight brand new tracks, VREID are ready for the next chapter.